Nobody wants to fail. Everybody wants to thrive, and often the office space design we’re surrounded by plays a vital role in the way we feel, behave, perform, and whether we stay or start looking for our new career venture. According to Forbes*, in recent years Human Resources leaders and executives all over the world have been focusing more and more on the employee experience, placing as much emphasis as they do on the customer experience. Successful businesses are full of talented and ambitious people who care, and who want to see that their employer will do for them as much as they’ll do for their employer. It’s vital for any organisation to offer an employee experience, an office space design, that will not only attract the best people, but also have a positive impact on staff retention levels. A key part of that employee experience is the environment they work in every day. The office space design employers offer is one of the most tangible ways for employees to live and breathe your brand, what you stand for as a business, and can often be a reflection of what you expect in return. A clever and effective office space design idea can go a long way when trying to inspire pride in your workforce. Making your employees feel proud of what they do, and who they do it for will only inspire them to push themselves even more. But not feeling part of one team working towards one goal can often be a distraction, diluting efforts if there’s no sense of unity or common objective. Often big organisations operate from different sites, sometimes on the same campus, and often at totally different locations. When AstraZeneca decided to relocate their Marketing function, top of the company’s agenda was to avoid a sense of isolation from scientific colleagues. With science-led teams now elsewhere, we brought science to the Marketing team’s new office. The team was starting the new year in their new offices, so we made sure everything was in place after the Christmas break, providing the team with a fresh new start designed to instil energy and enthusiasm, and reminding them that they too are a vital part of the world-leading science delivered by AstraZeneca. 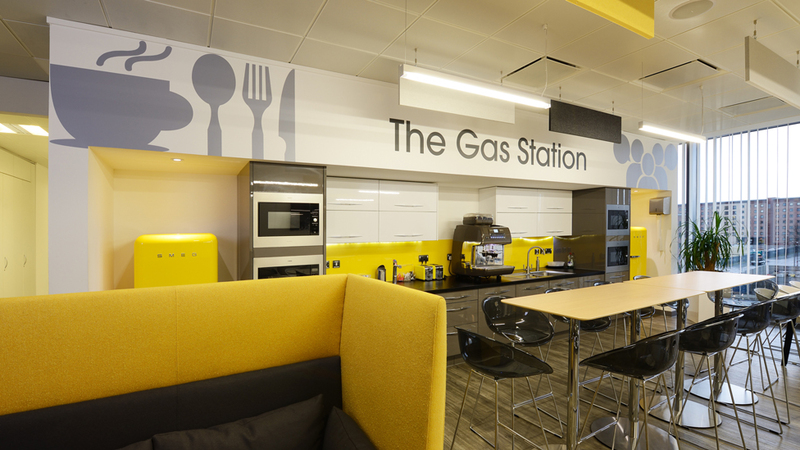 Every area of the unique workspace is filled with the science that has made AstraZeneca a global leader: beautiful scientific images, inspirational messages and descriptions, vibrant colours, all come together to make a lasting impression on employees, and visitors. There are many ways to communicate with your employees, to thank them for their contributions, to make them feel proud of them and encourage them to strive for more. One of those ways is to dress your office environment in your employees’ efforts, literally. Camaraderie and fun encourage collaboration and team work. Done the right way, it helps staff stay confident and focused on reaching the next milestone. 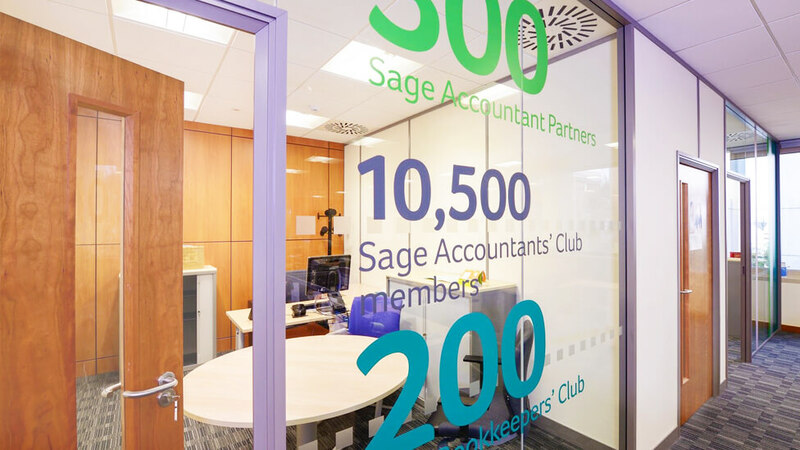 The office space design we created for Sage does exactly that: it’s an inspiring environment that energises teams by putting people, and what they’ve achieved, at the forefront. It tells them that every contribution is valuable and makes a difference, to the company and their colleagues. 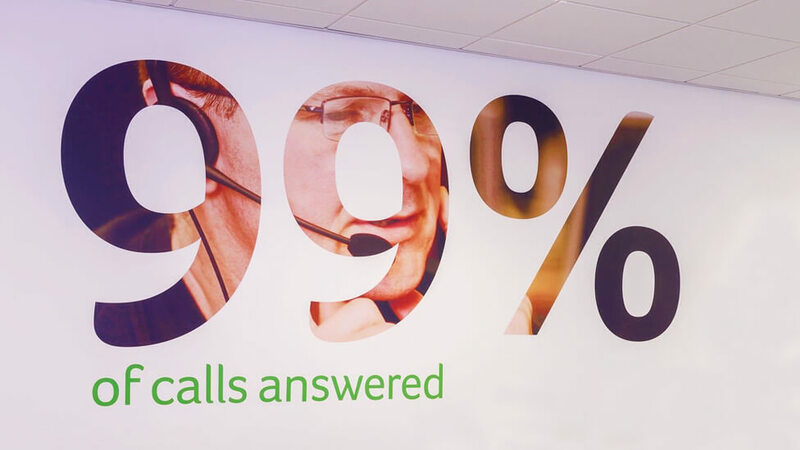 Large scale photographs of employees next to messaging from Sage’s brand maximise the impact of the office space design, and contribute to a sense of pride and motivation. 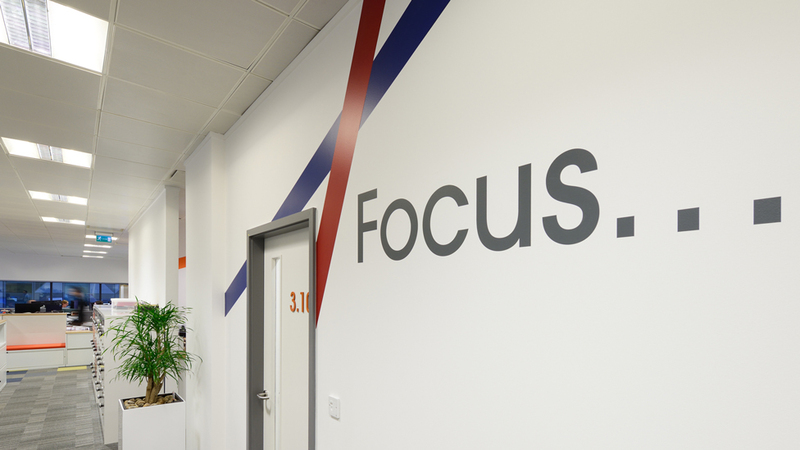 Our office branding solution also brings teams closer together: with the operation distributed across 5 floors, there was a risk of lacking a sense of ‘team’ and belonging. 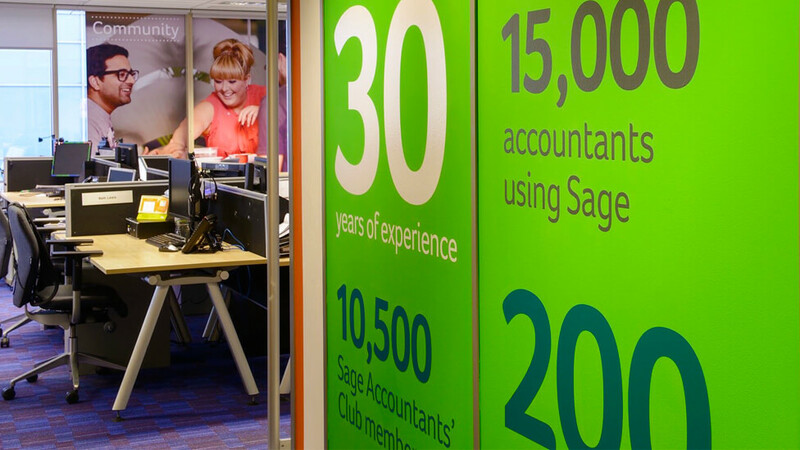 We worked closely with Sage to ensure that all employee photos were placed on the floor they worked on. With this done five times across all floors, it not only triggers conversations, but the different individuals also experience consistency and unity. Be bold, grab their attention, and highlight achievements for everyone to see, celebrate and congratulate on. A friendly and approachable photography style presents people who are emotionally invested and totally committed, acting as motivators for their colleagues. The scale of the photography and graphics hints at the magnitude of the data every employee impacts on a daily basis. Large fonts highlight the importance of those business results, and by applying a cut-out effect, the people behind those achievements are revealed. These two design elements combined act as a motivational tool, as they highlight how important individual contributions are, as well as acting as a constant reminder of targets to hit. 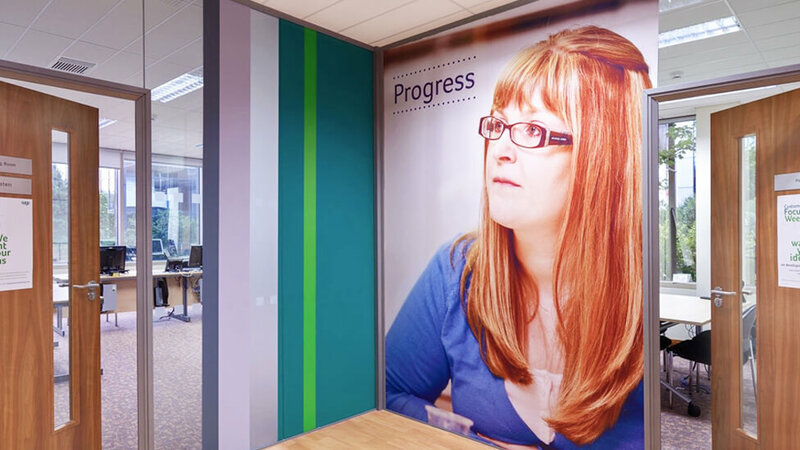 And we did all this maximising Sage’s investment in the project: we used a variety of materials for the different surfaces within the workspace – vinyls on glass, digital wallpaper and branded directional signage. When a company expands, it’s often a time for celebration of past achievements and excitement for the future. But it can also be a time when employees may often lose focus, and get distracted by what’s going on around them; it can sometimes also make them feel uncertain, even anxious about the future. Providing a fresh and interesting office environment can help employees refocus their efforts as it helps transmit that they’re considered very much key contributors to the organisation. 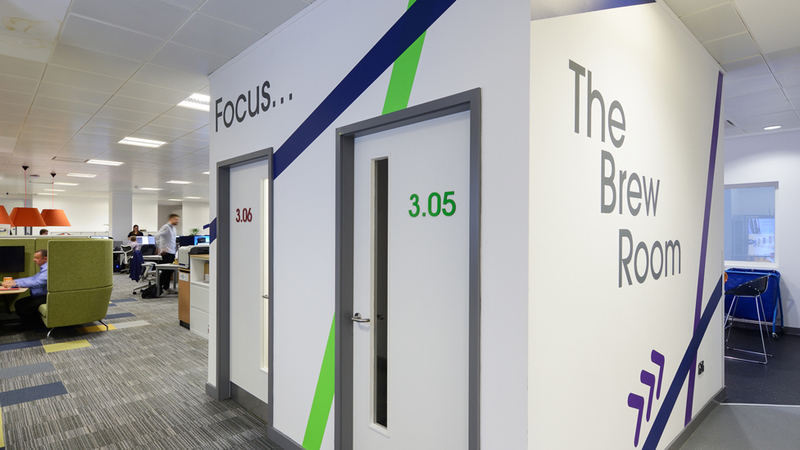 Our client Gazprom sees staff as its main value, so when – following global expansion – they needed to build completely new offices, they came to us to help them turn a temporary office into a space where employees felt relaxed, reassured and ‘at home’ straight away. We designed and built signage that immediately inspires, flows throughout the workspace, and feels prestigious and permanent, settled. 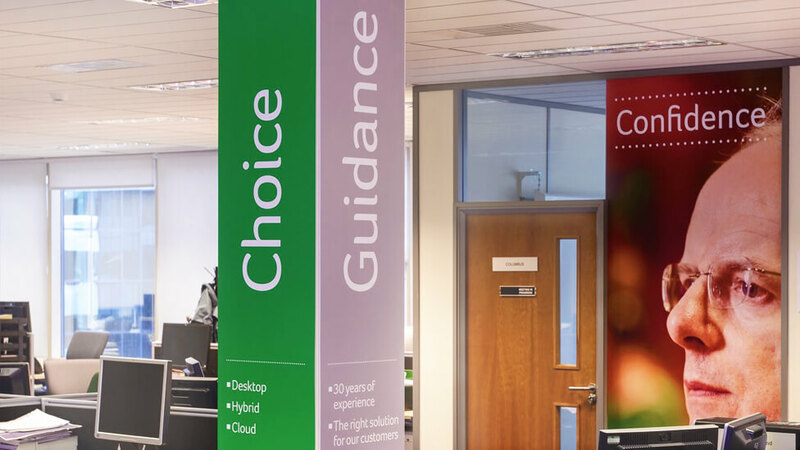 Integrating an existing stripe design pattern, we applied red and green brand colours to the reception area and window graphics. HRonline aspired to push their young company to the next level of cloud-based HR software solutions. 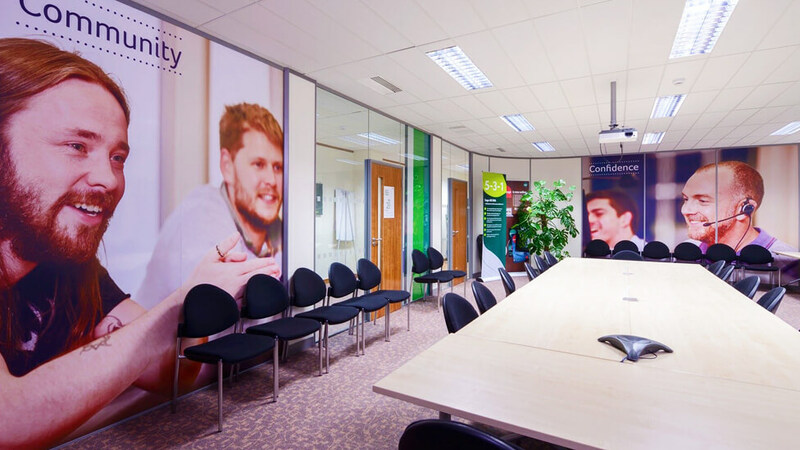 Our client saw an inspiring office as key to achieving their ambitious goals, so they needed a new unique office environment to attract the kind of employee that ‘thinks big’. We matched our client’s ambitions and created ‘Cloud 9’. Inspired by Jack and the Beanstalk, our experiential design team changed the environment into a Land of the Giants up in the clouds: oversized furniture in the shape of boulders, signage, wall vinyls with winding vines and a garden area, all inspired collaboration, creativity and innovation, free thinking and high performance. And it was all a surprise, with our team installing everything in secret. The central meeting area is now a cloud-based ‘Land of the Giants’. The colossal garden includes a variety of features that call for interaction, including wooden benches, oversized bean bags designed to look like leaves and illustrations of beanstalks winding their way round columns and walls. A stratospheric motif encourages staff to aim high, while soft lighting – achieved with billowy cloud linen fixtures – transmits that this really is unlike any other office, or company, and that it’s ok to take risks to come up with big ideas. By celebrating past achievements, you inspire future generations. That’s what we helped AstraZeneca achieve when the company decided to move most of their Research & Development operations from Cheshire to the growing Biotech and IT hub in Cambridge: we developed a striking and memorable piece of office space design that honours our client’s scientific legacy by turning science into art. The design also helped celebrate a key recent announcement in an unveiling ceremony, open to an exclusive audience of renowned scientists: their latest drug development against lung cancer had been approved in the US – a milestone and a positive step toward AstraZeneca’s ambitious goal to fight the disease. The design would also make a significant impact on employees in Cheshire, as over 700 AstraZeneca staff were remaining at the historic site. We were given a blank canvas – an empty space on a wall located strategically in the reception area of their flagship building. The design would be seen by thousands of visitors and employees that walk through the area year after year, so we ensured the design had a prestigious feel, to match the message and intentions of our client’s commission. Inspired by AstraZeneca’s excellence in science, we turned a molecular chain into a timeline where biological and pharma achievements are celebrated. The timeline culminates in the development of Tagrisso, the drug that signals a new and exciting chapter for AstraZeneca. By raising the larger cells, we gave prominence to discoveries made at the site. To ensure the design was structurally sound, a cladded metal frame supports it, so we worked with Dibond, a very lightweight – yet rigid – material. The striking design, which will inspire scientists for years to come, made an impact immediately.